September is underway and I’m sure many sellers may have already begun their preparation to make the best out of Upcoming Holidays season 2016. What retailers should keep in mind? With an auspicious season coming around the corner, people from across the globe would like to purchase their favorite products or even send gifts to their friends and family. Hence, allowing them an excellent online shopping experience will help you make them stick with your brand even after Holiday Season 2016. You may come up with winning holiday strategies all in an effort to attract consumers buy your products, but, targeting them blindly can lose you multiple potential sales opportunities that you would not like to miss during the season. 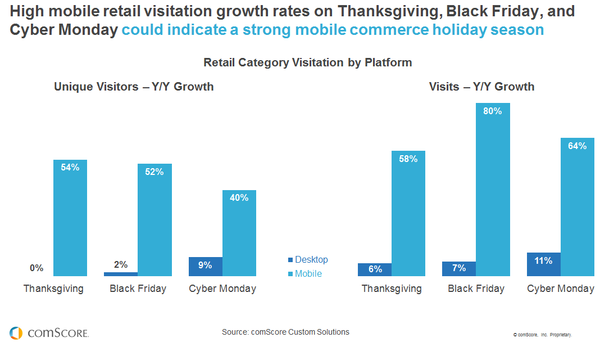 M-commerce– Mobile is eating brick-and-mortar retail sales during the holiday season as per comscore.com. Considering the image below you’ll understand how mobile can be an effective source to increase revenue growth rate for your retail business during the season. Ensuring your selling website is mobile optimized can increase chances of your products getting visibility across multiple devices that are being used by online shoppers. Personalized recommendation– Offering your existing consumers with product recommendation prior to holiday season can help you boost sales opportunities during those days. 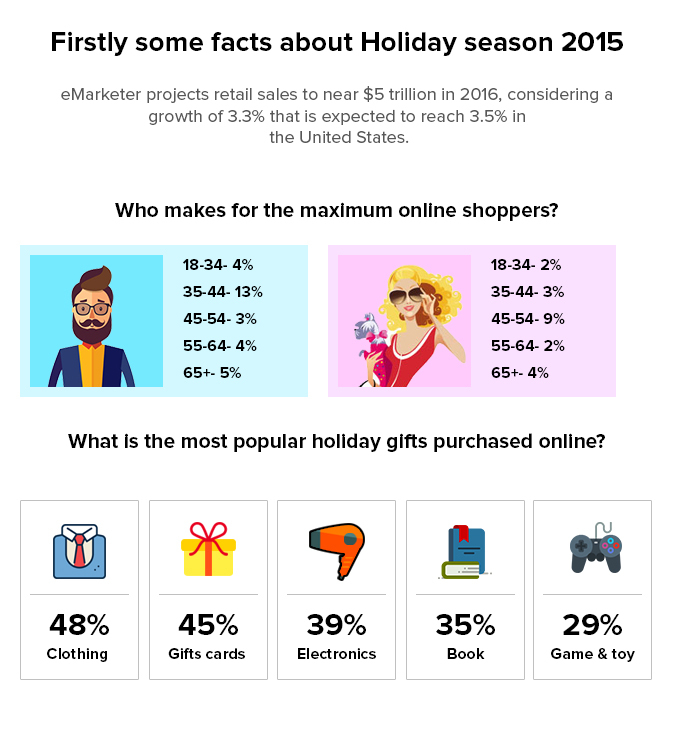 As per an article mentioned on CMO– 39% of retailers’ holiday promotional strategy is sending personalized product recommendations via email. You should not overlook the contribution of customers who have already shopped from your retail store. In order to offer a value to your existing customers it helpful to pre-target your holiday sales promotional offers to make them feel you care for their holiday purchases and you have products that could fulfill their shopping needs. Also, offering special discounts as a loyalty benefit can increase the chance of them shopping from your brand during those days. Infusing excellent product reviews, as well as, allowing consumers an ability to know more about the usage of promotional products via video tutorials can help you enhance your holiday loyalty marketing campaigns. With hundreds and thousands of sellers performing multiple holiday season promotional strategies may make it difficult to come up with a winning pricing strategy for your products. Free shipping– The 2015 Holiday survey by Deloitte says free shipping is one of the top-most advantages that consumers opt when spending during the holiday season. To make it easy, looking at the below image will make you understand what does fast shipping mean to consumers during holiday season. Almost every online retailer will offer free shipping on certain products, to enhance consumer’s holiday shopping experience. However, free shipping at the same time should be a quick delivery. Combo offers– Another effective trick is to allow consumers shop for multiple products in one order for a better price. This way a retailer can focus on a single discounted price for multiple products, rather than offer discounts for each product individually. Chances of consumers receiving a better price for each product they wish to purchase/gift in a single order can increase, than those provided by competitors on separate purchases. Product bundling can help you offer different products as a single order, giving you an ability to enhance your promotional strategies too. Offering your new product line in the combo pack for much-discounted price or even free can surely help you enhance a consumer’s holiday shopping decision and encourage more and more to make purchases from your brand. Being a season of happiness and joy many online shoppers would like to receive or expect their purchases to reach their friends and family at the earliest. And, referring to customer service experience report by UPS delivery speed is the fourth important factor when online consumers compare retailers. 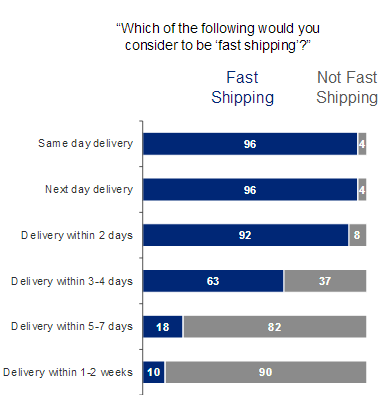 Same-day-delivery– With 96% considering same-day delivery to be the fastest shipping option during holidays, it may be difficult for small and medium-sized retailers to perform it. FedEx Holiday Service schedule can help plan your one-day-shipments needs by offering a number of shipping options specially designed for this holiday season 2016. Next day delivery– Recording with an equal percentage of preference (96%), next-day delivery can be focused to enhance consumer’s shopping experience during the holiday season. UPS another popular shipping service is allowing retailers to fulfil their customer’s orders via UPS Next Day Air. 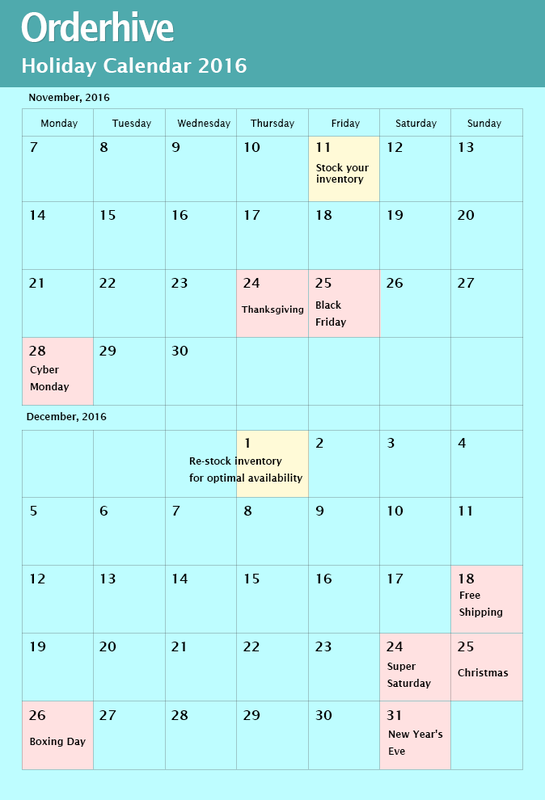 Considering UPS holiday shipping schedule 2016 can help you plan ahead to ensure you are able to deliver your customer’s holiday purchases in time. I’m sure retailers are well-stocked with products as they would not like to miss any opportunities during the major selling days of the year. However, at the same time you need to have an organized inventory management system in place. Automation– Manually adjusting stock levels during those rush days can eat up more time which can be eliminated by automating your inventory updates. Infusing inventory management software in your back-end operations will ensure all your products are immediately auto-updated across to your multiple selling stores. Centralization– In order to make the most out of this holiday season, you may sell across multiple marketplaces and via your online stores too. However, processing each of your store’s orders separately can consume time in fulfilling them, and in worst cases, you may miss delay in delivery. Centralized order management system can be a time-saving solution for retailers during the holiday season. 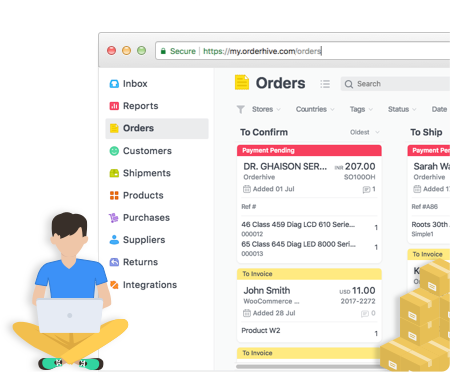 This will help you bring all your customer’s orders coming from multiple stores at one place increasing accuracy and ensuring every order is shipped and delivered in time. Holiday season will have a mix of customer’s preferences for receiving their orders which can include in-store delivery too. Flexibility in your fulfilment providers can help you win the game. Amazon FBA– Sellers selling on Amazon are already enjoying FBA benefits that do not only allow sellers stock their products at multiple Amazon warehouses across the globe but also, fulfils their channel’s customer’s orders via Multi-channel Amazon Fulfilment Service. If you are already selling on Amazon, I’m sure you won’t miss out on the multiple benefits FBA provides, however, if you sell on other marketplaces adopting Multi-Channel Amazon Fulfilment Service can help you enhance consumer’s delivery option applicable for all your online retail stores. Easy integration – Selecting a correct shipping solution at the correct time to match consumers delivery needs can be tricky and confusing will all carriers offering retailers with best shipping options, especially for the holiday season. Adopting software that allows easy integrations can help you gain access to multiple shipping solutions on-the-go. This means, instead of login into different accounts to fulfil your customer’s holiday orders, save time and effort by connecting with the best shipping solution, always. Social media– As per eMarketer social media influence shopping behaviour, therefore, running pre-holiday promotional campaigns across popular sites that include Facebook and Instagram can help you keep your brand alive in consumer’s mind until the day and during holidays too. Email marketing– Email is still considered to be an effective marketing tool according to an April 2015 survey that was conducted among US marketing executives. Last year MailChimp created a new recorded with 1.2 billion emails sent during Thanksgiving week, with Black Friday and Cyber Monday counting for the highest. Offering an ability to perform automated email marketing campaigns, MailChimp also helps retailers with holiday marketing tips to be a part of the best marketing campaigns this holiday season. So start planning your holiday promotions now!